Objectives: Laparoscopic appendicectomy has been reported as a safe and effective alternative to the open technique in children. However a majority of studies comparing these techniques in children have been conducted in paediatric surgical units. 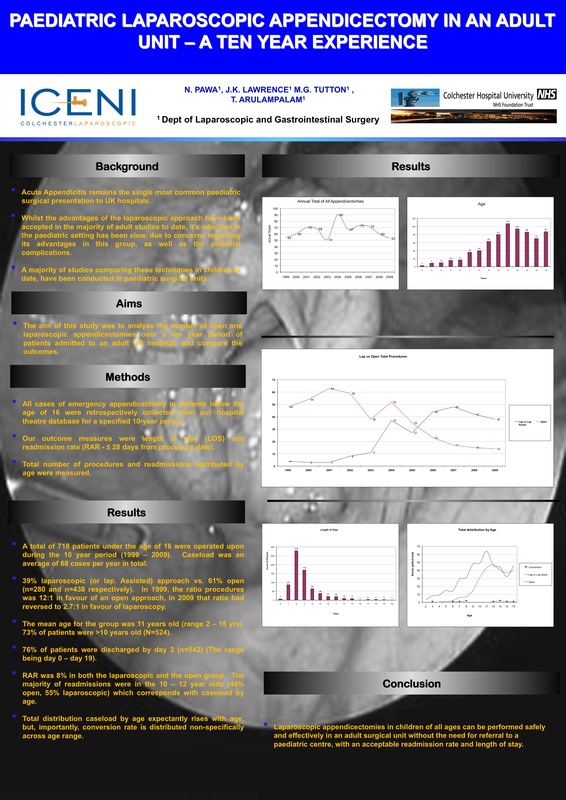 The aim of this study was to analyse the outcomes of laparoscopic appendicectomies performed in children in an adult surgical unit over a ten year period. Methods: A retrospective review was performed of all appendicectomies performed on children (<16 years) between 1999-2009.The number of procedures per year including laparoscopic, open and conversions were collated. Patient demographics and length of stay including readmissions within 28 days were analysed. Results: A total of 718 procedures were performed during this period, with a mean age of 11 years. From this 280 cases were performed laparoscopically and 438 open. There were a total of 10 (3.6%) conversions to open from the laparoscopic group. A total of 7.5 % (laparoscopic-20, open-34) of patients were readmitted within 28 days. The mean length of stay for the laparoscopic group was 2.9 days and 3.1 days for the open group. Conclusions:Laparoscopic appendicectomies in children of all ages can be performed safely and effectively in an adult surgical unit without the need for referral to a paediatric centre, with an acceptable readmission rate and length of stay.